In most sales organizations, there are 2 crippling truths—1) 80-90% of sales are generated by only 20% of the sales team and 2) turnover is abysmal. This brings us to an important question. Why is that only 20% of the sales team generate such a disproportionate amount of the sales? What if you were to only hire the "best of the best" salespeople--those who generate the 80-90% in any other organization? What would happen as a result? Your sales would skyrocket and your turnover would be dramatically reduced. The Fiaccabrino Selection Process (FSP) is a proven methodology for increasing sales and reducing turnover. It teaches you how to select only the "best of the best" for your organization. Get the FSP Primer below. Download a FREE COPY of the Fiaccabrino Selection Process (FSP) Primer. This primer is a 21-slide PowerPoint presentation explaining the FSP. Provides an overview of the methodology and 16 Humanistic Attributes. WHAT IS THE FIACCABRINO SELECTION PROCESS? The Fiaccabrino Selection Process (FSP) is a powerful methodology for interviewing and screening the best people for your organization. The objective is to select those people who will be the highest performers with the lowest turnover. Whereas the methodology was originally developed for a sales organization, it can easily be modified and tweaked for other functions. In fact, it has been used for positions from Marketers to Research Scientists to Pharmacists. The core of the framework is to understand 16 critical Humanistic Attributes. The full framework document will explain each attribute in detail and provide insight into how to evaluate your candidate's competency across each attribute. At the end of the day, the candidate must excel across all 16 of the Humanistic Attributes. The 16 Humanistic Attributes and Behavioral Quadrant. The Fiaccabrino Selection Process was developed by Charles Fiaccabrino. You can download the Fiaccabrino Selection Process Primer for free above. Alternately, you can get the full framework here. 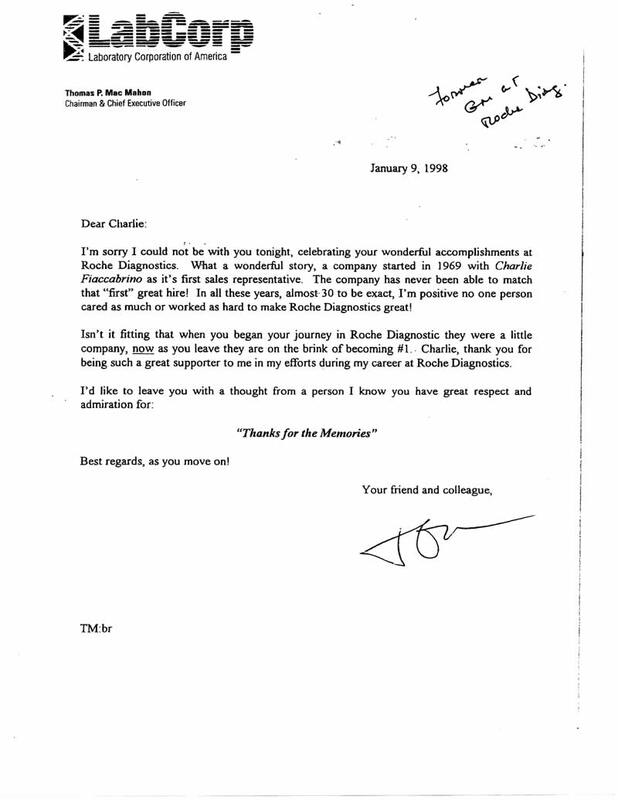 WHO IS CHARLES FIACCABRINO (AKA "MR. ROCHE")? Charles Fiaccabrino is a subject matter expert in all topics Sales and Sales Management related. He spent the majority of his career, 28 years, at Hoffman La Roche (a $50B Fortune 200 company), where he was known internally as "Mr. Roche." Charles was hired at Hoffman as the first diagnostics sales representative in the newly formed Diagnostics Division. He then helped grow it from its small business/startup roots into a multi-billion dollar organization, known as Roche Diagnostics. In the early years, Charles was responsible for over 80% of the national sales. Through his career Roche, "Mr. Roche" earned the President's Achievement Award an unprecedented 20 times. What was undoubtedly the core reason for his success as a manager is his uncanny ability to evaluate people. 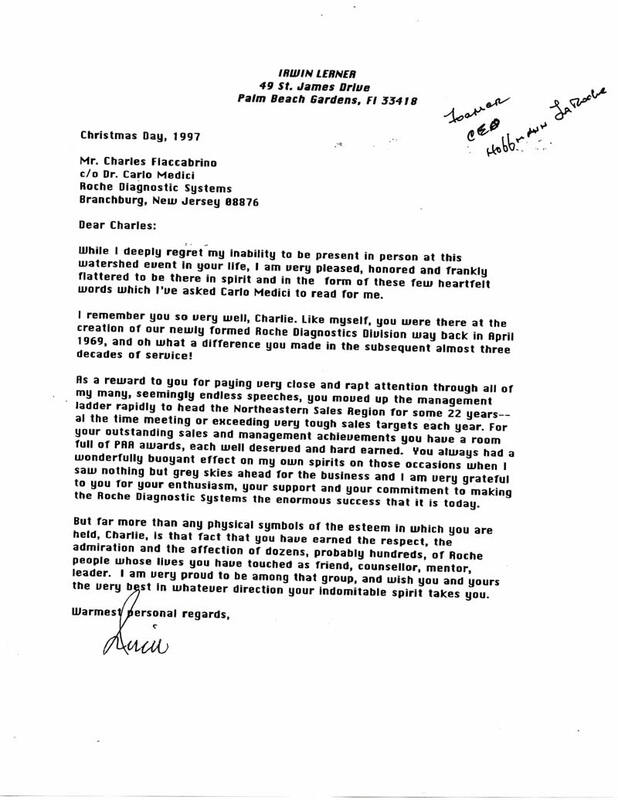 Charles was able to target select some of the greatest performers in the history of his company. His ability to recruit, select, develop, and lead are some of his major strengths. These skills extend beyond Sales, Sales Management, and the Healthcare/Medial Devices industries. After his retirement from Roche at age 65, Charles formed the Fiaccabrino Group Ltd, specializing in all facets of Sales Management. Early on in his consulting career, Charles developed a business plan for a recruiter in which he would evaluate candidates prior to sending and recommending to the respective hiring managers. 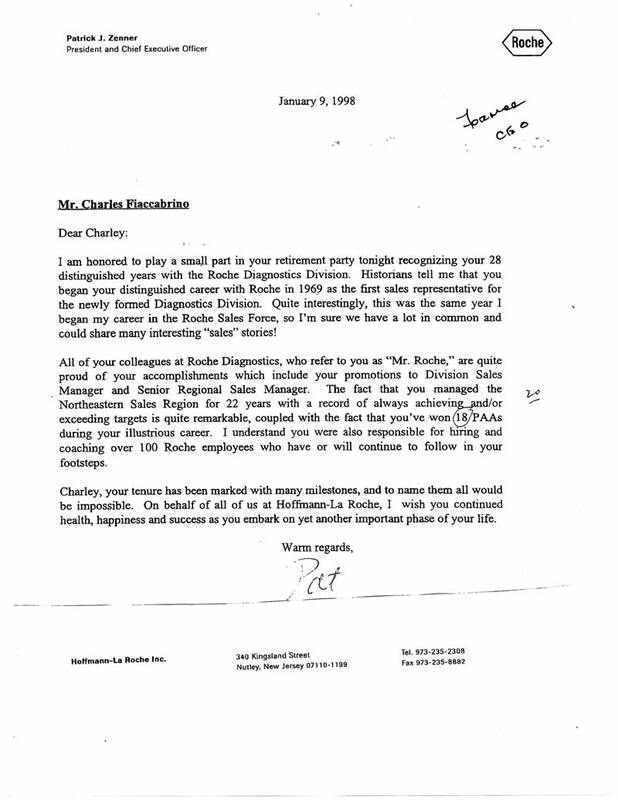 Because of Charles Fiaccabrino's reputation, the company was retained by a large multi-billion dollar company that had sales people turnover issues amounting to a 35-40% turnover rate. With Charles expertise in evaluating candidates, the turnover rate went down to 2% (a very significant change that was noted by all those who have the background and expertise to fully understand its significance). “ ... you have earned the respect, the admiration and the affection of dozens, probably hundreds, of Roche people whose lives you have touched as friend, counselor, mentor, leader. “ All of your colleagues at Roche Diagnostics, who refer to you as 'Mr. Roche,' are quite proud of your accomplishments ... I understand you were also responsible for hiring and coaching over 100 Roche employees who have and will continue to follow in your footsteps. “ In all these years, almost 30 to be exact, I'm positive no one person cared as much or worked as hard to make Roche Diagnostics great! Would you like to gain information and insights directly from the guru himself? Charles Fiaccabrino is currently working with Flevy to provide customized advisory services. We will work with you to provide you the service needed, as it relates to better understanding the FSP and how to implement it and related strategies for your organization. Please complete the form below. Charles Fiaccabrino has contributed a number of narratives to the Flevy blog. You can read them here. Also, please take the time to download and familiarize yourself with the FSP by getting the free primer.